The boat meets the latest and the highest standard of Lloyd Register to sail in Polar Region. Hondius offers hotel type accommodation. Fast zodiacs to a short time in the sea and focus on shore activities. A wide variety of activities including polar diving, kayaking, camping, photo workshops. Hondius can carry 176 passengers on board. The boat has 82 cabins in total. 4 quad cabins, 2 trips can be shared if you are traveling with friends or with your family. There are also 28 twin rooms with portholes and 14 twin rooms with windows. For those who prefer luxury accommodation, boats can offer to stay at one of the suits or book the special hondius suit that has 4 windows to enjoy the beautiful view, a double bed, and comfortable sofa. All staterooms have private facilities, TV, coffee tea maker, hairdryer, cabinet. A big lecture room is perfect for workshops, exhibitions, and performances. Boat’s guest can also spend time in the large observation lounge. Hondius offers various routes. Visit the Falkland Islands to see albatross colonies, Magellanic penguins and gentoos or elephant seals. Take a part in Antarctica Discovery and learning cruise, where you can to listen to naturalists lectures. You may get a chance to visit the former British research station now a museum and post office. 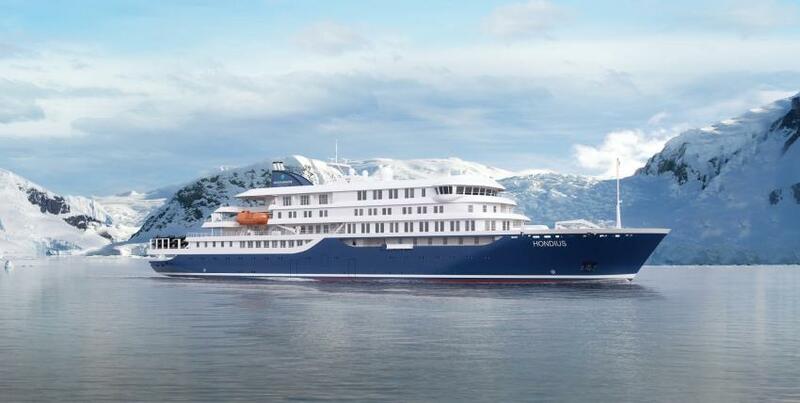 Hondius passengers will get a unique chance to meet whales and to see one of the most amazing sightsing northern lights.